Fri., May 6, 2016, 5:09 p.m.
PROVIDENCE, R.I. – The curtain fell a final time for elephants performing at Ringling Bros. and Barnum & Bailey Circus as the circus ended a practice that enthralled audiences for two centuries but became caught between animal rights activists’ concerns and Americans’ shifting views. Six Asian elephants danced, balanced on each others’ backs and sat on their hind legs Sunday during their last show in Providence, Rhode Island. “This is a very emotional time for us,” Ringmaster Johnathan Lee Iverson told the crowd as the performance came to an end. He called elephants beloved members of the circus family and thanked the animals for more than 100 years of service. Elephants have been used in the circus in America for more than 200 years. In the early 1800s, Hackaliah Bailey added the elephant “Old Bet” to his circus. P.T. Barnum added the African elephant he named “Jumbo” to “The Greatest Show on Earth” in 1882. Five elephants also performed earlier Sunday in a Ringling Bros. show in Wilkes Barre, Pennsylvania. 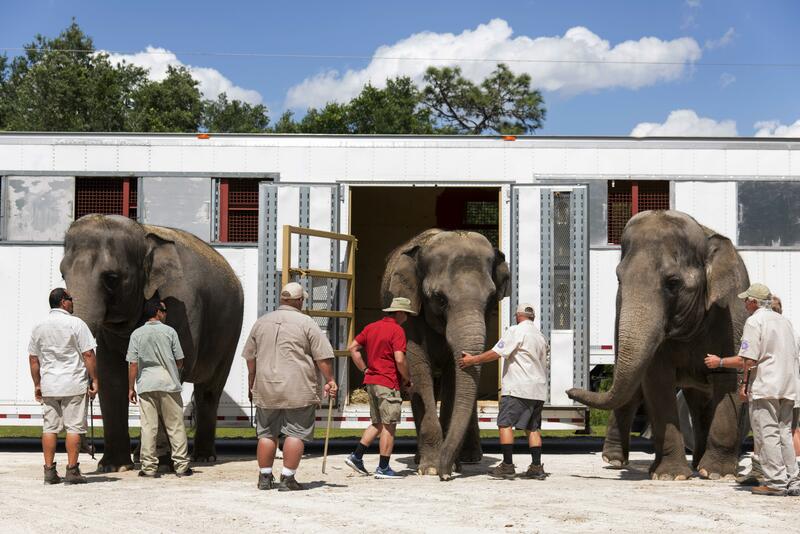 The animals now will live at Ringling’s 200-acre Center for Elephant Conservation in Florida, said Alana Feld, executive vice president of Feld Entertainment, which owns the circus. Its herd of 40 Asian elephants, the largest in North America, will continue a breeding program and be used in a pediatric cancer research project. The Humane Society says more than a dozen circuses in the United States continue to use elephants. But none tours as widely or are as well-known as Ringling Bros.
It’s also getting more difficult for circuses to tour with elephants. Dozens of cities have banned the use of bullhooks – used to train elephants – and some states are considering such legislation. Before Sunday’s show, around half a dozen protesters stood outside, including one wearing a lion costume, to protest Ringling’s use of animals. Ringling will continue to use animals, Feld said. Sunday’s show included horses, lions, tigers, dogs, pigs and other animals. The Humane Society has called for an end to the breeding program at Ringling’s Florida center, and for the company to retire its elephants to one of two accredited sanctuaries, one in California and one in Tennessee, both of which have more than 2,000 acres of land. Published: May 6, 2016, 5:09 p.m. Tags: animal rights, circus, elephant, elephants, humane society, ringling bros.